Women's Trachten T-shirt in rose. 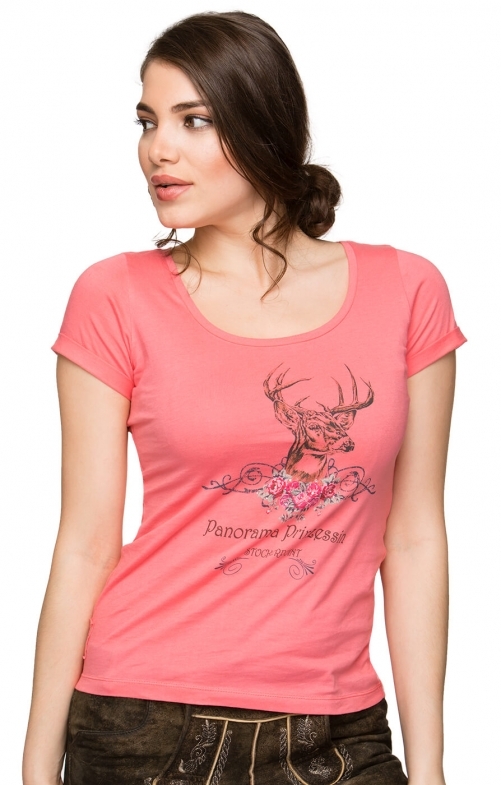 With a flattering scoop neck and short sleeves, this simple T-shirt from Stockerpoint is embellished with a traditional motif of a stag's head and rose garland and a "Panorama Prinzessin" graphic print. In a gorgeous shade of antique rose, this T-shirt looks fabulous whether with leather shorts at Oktoberfest or with your favourite jeans for an Alpine walk. hat vom Schnitt her nicht gesessen, deshalb zurück; dünneres Material, Preis-Leistung ok.